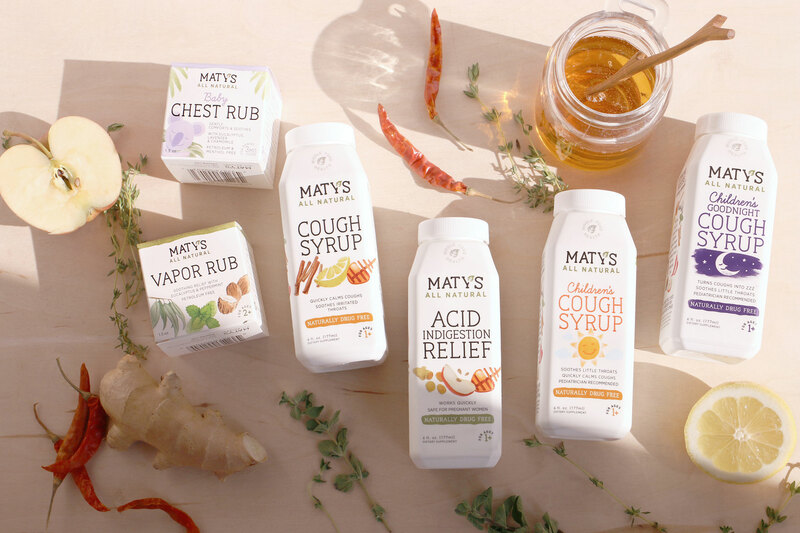 We love Maty’s, the creators of holistic cough syrups and remedies made with whole-food ingredients. And we love a good brand makeover, so we were delighted to develop a new look and packaging to help the wellness pioneers stand out on shelves. The nearly 10-year-old company, named for the daughter of founders Bob and Carolyn Harrington who sought out safe, all-natural remedies to heal Maty after she was born with serious health problems, came to us in a time of growing retail distribution. Now on shelves at Target, CVS and RiteAid, Maty’s competes with conventional brands like Robitussin as well as natural options. With interest in healthier alternatives soaring, the company wanted to boost brand awareness, capture market share and appeal to wellness-minded consumers. That meant standing out—and that meant evolving. While most over-the-counter medicines, as products, tend to have a clean, clinical, even sterile aesthetic, it made sense to us to match Maty’s outside—its packaging—with what’s inside. The Haberman design team set out to create a new logo and packaging that would look right at home in the kitchen cabinet (more so than the medicine cabinet). We designed a dozen packages, most of which are now in stores across the country.